The Graph Maker App in Origin allows you to make common 2D graph types with ease. This app is available in Origin 2019 and up. Don’t have the version 2019? Download the trial version from the DOWNLOAD TRIAL menu above. Graph Maker app is pre-installed in Origin 2019. To activate the Graph Maker app, first activate the workbook with data you want to plot, press F1 or click the Start menu located at bottom-left corner of Origin workspace, and type ‘a Graph Maker‘. click the Graph Maker under Apps. The Graph Maker dialog will pop up as shown below. 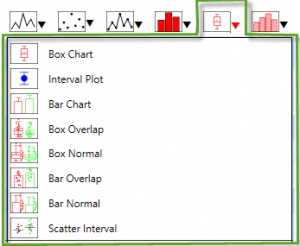 The app contains graph types of linear, scatter, line+symbol, column, box and histogram. If you click the black triangle next to each graph or hover over a graph type, a drop down list will appear with all the graph available under each graph type. All the columns in your workbook are listed under the Columns. By clicking the black triangle next to the column label, you can select an identifier to view columns and also you have the options to sort the column by identifier, by column index or by data type. From the list of columns, you can drag and drop the desired columns for the X and Y axis under data. The Y axis can accommodate a single Y column or multiple Y columns. In the case of multiple Y columns, the Y axis on the graph will take the label of the top most Y column. 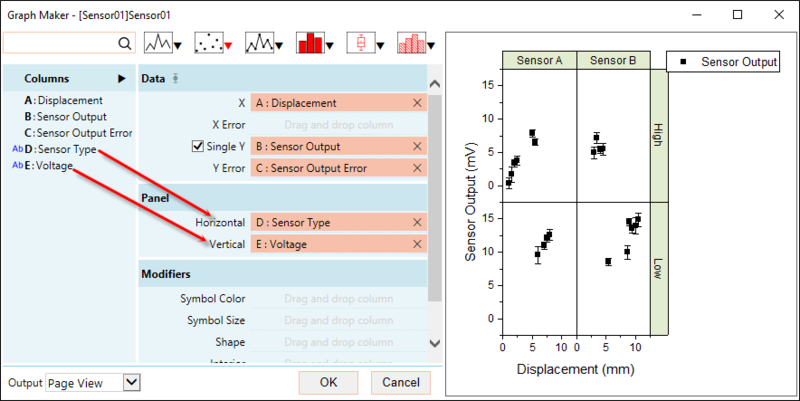 Error – If there are columns with X or Y error, then you have the option to plot error bars by selecting error check box next to Data label. Example of Y axis with single Y column and a Y error column. Example of Y axis with multiple Y columns. By dragging a an appropriate columns to the panel, you can add vertical and horizontal to your graph. For selected graph types, this allows you to categorize lines, symbols, filling colors and patterns according to selected column. For the scatter graphs, you can do a polynomial fitting with a choice of polynomial order, confidence and prediction bands and confidence ellipse of mean and prediction. Also you can change the colors of the bands and lines and has the option to show the fitted equation and R^2 value and Pearson’s R.
Once you plot the graph, you have two options to output the graph, window view and page view. Once you output the graph, you can modify the axis,titles, symbols, colors, labels,…etc. as you do in a normal graph. While the App is open, you can add or delete columns and edit the data in the columns and the App and the resulting graph will update accordingly. Also you can use the same column for different items at the same time, for example you can add ‘Sensor type’ column to Panels, to add panels to the graph and at the same time add it to the Modifiers to change Symbol colors. For more information on Graph Maker App, visit the App page.